Background: The Tennessee Walking Horse National Celebration is going on this week in Shelbyville, Tennessee. US Department of Agriculture veterinarians are on hand to inspect horses for evidence of "soring", the illegal practice of artificially enhancing a horse's gait. Also on hand are representatives of local organizations who are conducting their own inspections to see if they agree with the USDA results. Dr. Stephen Mullins, president of the local inspection group SHOW, says that USDA inspectors issued five times as many citations in the first six days of this year’s Celebration as in all 11 days of last year’s, according to the Nashville newspaper, The Tennessean. This week, a press conference was held to publicly inspect two of the horses rejected by the USDA. This is shown in the video. On August 30, the Walking Horse Report conducted an interview with Scott Hopper, DVM, MS, Dipl. ACVS from Rood + Riddle Equine Hospital in Lexington, Kentucky. 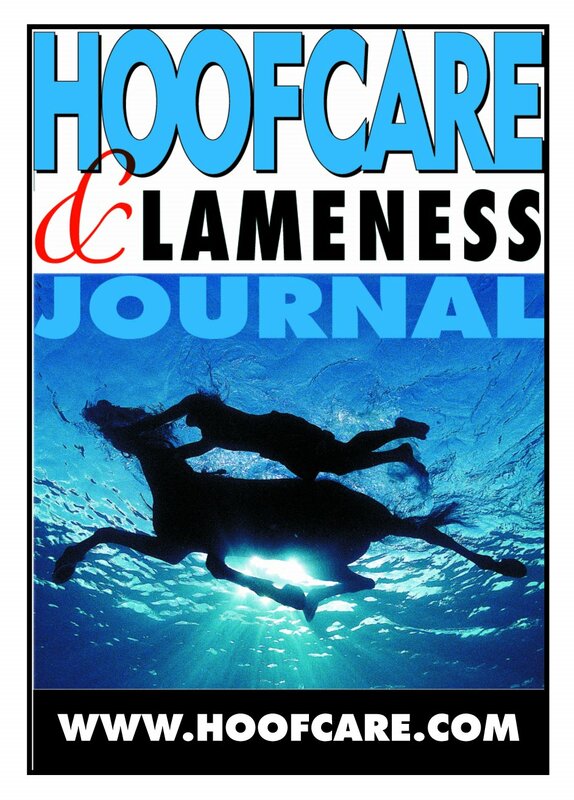 The Walking Horse Report has kindly agreed to allow the interview to be printed on The Hoof Blog. Dr. Hopper was at The Celebration on the first Thursday through Sunday nights of the Celebration and will be in attendance all three championship nights. Dr. Hopper is a graduate of the University Wisconsin – Madison School of Veterinary Medicine, holds a Masters degree from Washington State University, is a Diplomate of the American College of Veterinary Surgeons and currently works as a surgeon and partner at Rood and Riddle Equine Hospital, where he is head of the Rood & Riddle Stem Cell Lab. Q - During your inspection of the horses after they were disqualified by USDA VMOs, did you find horses that should have been allowed to show? A – I looked at approximately 30 horses the first four nights of the Celebration and yes many of these horses should have been allowed to show. The biggest area of concern I had was with the palpation of horses and those deemed sore by USDA VMOs. Approximately 70% of those cases, I disagreed with the VMOs and found nothing wrong with those horses. My initial exam was similar to those performed by the DQPs and VMOs and I could not elicit any response. I went one step further and performed a more aggressive deep palpation of the horse’s lower limb and again I could not elicit a response. These horses should have been allowed to show. Q – In your opinion, is the scar rule being interpreted as the “Understanding the Scar Rule” pamphlet distributed as the training manual to VMOs and the industry HIOs? A – No it is not. The scar rule is a very subjective rule and is not being applied consistently. Q – On those horses disqualified for scar rule violations, would you in your professional opinion, deem those horses sore? 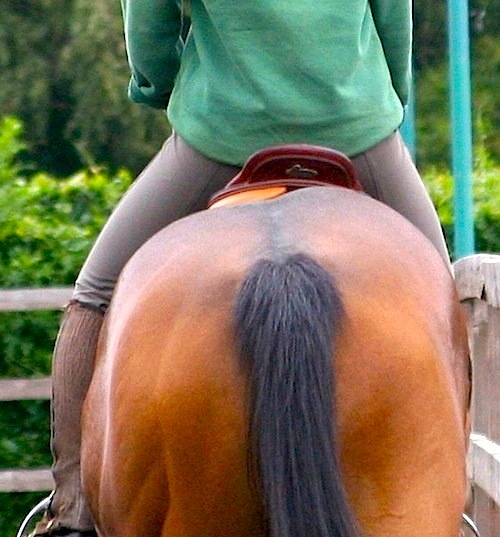 A – A scar rule violation could be called and the horse show zero signs of soring, nor would it necessarily mean this horse had been sored in the past. Q – Given that to be a scar rule violation the horse must show bilateral (both feet) scarring, did you see horses called out that only had unilateral (one foot) tissue change? Q – Of those horses that you inspected and those you saw enter inspection, in your opinion is soring required to participate? A – I don’t believe that horses need to be sored to perform at a high level at the Celebration. Of the horses I examined I saw no signs of abuse. If any owner or trainer believes that this is still necessary then they should be banned from the profession, because there is no place for it anymore. The Walking Horse National Celebration attracts thousands of spectators. Photo by Stephanie Graves. Q – Would you be a proponent of more objective testing rather than the existing subjective inspections? A – The industry needs to do everything it can to end soring. Yes, technology should be used to implement science-based, objective testing. The current inspections are very subjective, inconsistently applied and result in many unfair disqualifications. Sound horses are the only horses that should be allowed to show; but more importantly sound training methods should be the methods used in both the barns and at the show. Q – Would you be willing to work with reformers in the industry to help restore the proud tradition of the Tennessee Walking Horse? A – I have worked on many walking horses at Rood & Riddle, performing surgeries and lameness exams, and I know firsthand what a wonderful breed of horse the Tennessee Walking Horse is and can be. I have volunteered to serve in a capacity to help and would be willing to help with industry reformers that have a goal of ending soring and maintaining the welfare of the Tennessee Walking Horse. Q – Is there a problem with soring in the Tennessee Walking Horse industry? A – There are cheaters in every sport that think they can beat the system but I have no doubt that the inspections at The Celebration are doing everything they can to catch these individuals and put an end to soring. I did not see a problem with soring during my four nights inspecting horses at The Celebration. Q – Who contacted you about inspecting horses at The Celebration? A – Representatives from the Tennessee Walking Show Horse Organization contacted me through a mutual friend Dr. John Bennett. They asked me to come and examine horses to get my objective opinion on what I saw in horses that were disqualified from participation. Q – Is it possible with improper palpation of horses to have movement indicative of soring when in fact the improper palpation is the reason for the movement of the horses foot? A – It is definitely possible to make any horse move if that is the goal. 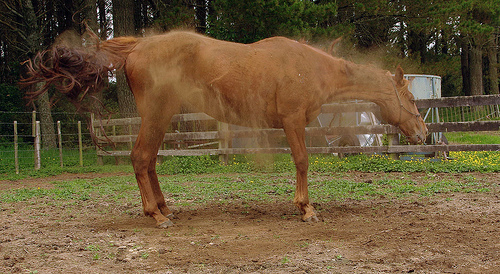 Improper palpation techniques can be used to induce movement which does not mean that the horse is sore. Q – Are those techniques being used in inspection? 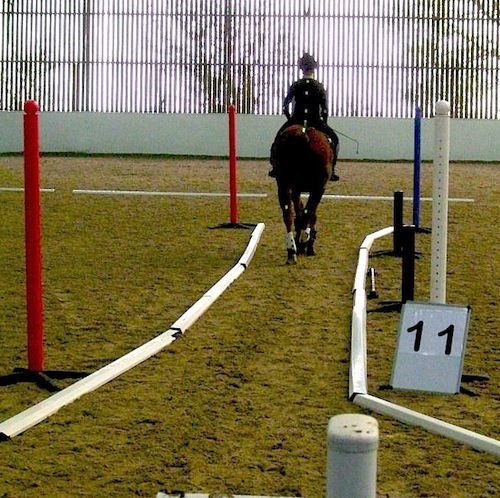 A – I cannot speak to that directly as I am not directly involved during those initial inspections, however I would say several horses disqualified for sensitivity to palpation immediately came to me and I could not get the horses to show any sign of sensitivity to palpation, even when I aggressively palpated those horses. Palpating the limbs of lame horses is what I do for a living, if a horse was sore I would know it. Original article appeared on the Walking Horse Report web site. The Hoof Blog hopes to also have an interview with Dr. Tracy Turner, who is at the Celebration acting as a consultant to the USDA. Qualisys demonstrated its 3D gait analysis system at the International Conference for Equine Locomotion (ICEL) at Stromsholm, Sweden this summer. It's back to school time in the USA. And it affects all of us. Maybe it's seeing all those three-ring binders in day-glo colors in the stores. Maybe it's the traffic jam around the mall. Maybe it's seeing little kids "learning" how to wait for the school bus. But "back to school" resonates in each and every one of us, whether we are conscious of it or not. This time of year, our thoughts turn to self-improvement. Taking a class. Getting our lives in order. Clearing out the clutter. Making a plan. Finally learning Photoshop. Maybe, like New Year's resolutions, the plans fall apart or fade. After all, for most of us it is a case of "back to work", not "back to school". If you're looking for a secure future in the world of hoofcare and lameness, it is likely to involve some form of gait analysis or motion capture, and it's not too far off the mark to suggest that an understanding of gait and joint mechanics is deficient in most of our resumes. For instance, Qualisys writes,"The work was made in cooperation with equine researchers attending the conference...We set up a 60 camera system indoors and in the outdoor setting seen here we used 40-something Oqus 3+ cameras." Yes, you read that correctly: 60 cameras for the indoor test and 40 for outdoors. Would you have any idea what they would need 60 cameras for, what they were pointed at or what they were trying to capture? A few years ago, radiographs were big, clunky sheets of film that veterinarians kept to themselves. They slid in and out of envelopes, and there was always a worry about dust and dirt and fingerprints. Today, we take them for granted. They become part of a horse's portfolio and the ability to be at least familiar with them is assumed to be part and parcel of being a horse professional. A data collection session at the McPhail Center, where the equine biomechanics course is held. We are coming to a point where the same will be true of a horse's biomechanics portfolio. Maybe our horses won't be lucky enough to have 60 cameras pointed at them at once, but some mo-cap footage from somewhere may follow a young horse far into his performance career. It will be important that any and all video footage of a horse enhance his gaits and movement, not detract from them, and the horse's mo-cap files will be most critical of all. If you're a horse professional interested in equine biomechanics, the best immersion course offered in the world will be held the first week in October at Michigan State University College of Veterinary Medicine's McPhail Center for Equine Performance. Dr. Hilary Clayton presides over a soup-to-nuts assay of equine anatomy, gait and the intersection of the two in the field of study known as equine biomechanics. Students enjoy a casual classroom environment, hands-on access to the joints of horses, and a chance to work in the setting of one of the world's premier laboratories for equine study. The course is under the auspices of Equinology, which offers courses all over the world for aspiring equine body workers and affiliated professionals. Admission to the course has some prerequisites and requires advance registration. Your future could begin when you sign up for Equine Biomechanics with Dr. Hilary Clayton. Normally, this blog is a big advocate of conferences but the buffet-table style of education offered at most conferences with a big selection of speakers and topics can become diluted. After a while, people attend conferences to hear particular speakers or to have their own chosen theories or techniques reinforced or validated by the speakers. They don't go to hear what doesn't fit their agenda. Sometimes you need to step back from the all-you-can-eat buffet and sit down for a serious meal. You'll find that your return on investment is manyfold, and your palate may be expanded. Horse professionals have few opportunities for continuing professional education that takes them back to the classroom--and back to thinking seriously and critically about their work. This is one of those opportunities. So if the thought of a new pencil box can still make your pulse quicken, there's a course for you--if you get organized now...and if your pencil box always had a picture of a horse on it. About the Qualisys video: Most of us are accustomed to horses who trot, rather than pace. Both the trot and the pace are two-beat gaits, meaning that pairs of limbs strike the ground simultaneously. In most simple terms, the trot requires pairs of diagonal limbs (right front-left hind), while the pace requires pairs of limbs on the same side of the horse (right front-right hind) to extend and land simultaneously. This video shows an Icelandic being set up for a motion capture by Qualisys, and then shows the resulting imagery. The point of the video is that the horse is demonstrating the Icelandic's ability to pace. Studies utilizing the Pegasus limb phasing system and probably other systems as well were also front and center at ICEL 7. To learn more: go back and watch "Equine Biomechanics Integrated with an Icelandic Horse's Disco-Rhythm Hoofbeats by Swiss Researchers" from the University of Zurich vet school, as shown on the blog in January 2011. Click to instantly order your copy of this beautiful anatomy education reference poster of the inner hoof wall. Walking Horses, Soring and HSUS: Convicted Horse Abuser Says Horses "Have To Be Sored"
Warning: this video contains descriptive details that may upset you. Is he telling the truth? What was edited out? What does his body language suggest? The man being interviewed is former trainer Barney Davis. He uses a lot of lingo; "walk" refers to the unique Walking horse show gait; "band" refers to the hose-clamp style band around the hoof. "DQP" is a "designated qualified person", or non-USDA inspector performing inspections under USDA regulations. The practice causes intentional pain to the feet or legs of horses through the application of caustic chemicals to burn their skin, or by inserting foreign objects to the sensitive areas of their hooves. In reaction to the pain, horses lift their front legs high off the ground, producing the exaggerated “Big Lick” gait rewarded in the show ring. At his sentencing hearing in February, Davis admitted to routinely soring horses during their training, and explained that this illegal activity is so rampant as to be commonplace throughout the Tennessee walking horse industry. In The HSUS’ exclusive interview, Davis described common horse soring methods and their effects. He flatly stated that trainers must make their horses suffer to be competitive at “Big Lick” events, including the biggest of them all, the Tennessee Walking Horse National Celebration currently underway in Shelbyville, Tennessee. And he demonstrated how inspectors can better detect sored horses. Earlier this year, The HSUS paid a $10,000 reward for information that led to the arrest and conviction of Davis, who has competed for the title of World Grand Champion, the industry’s highest prize. As awareness spreads about the abusive treatment of Tennessee walking horses in the top levels of show competition, The HSUS is continuing its commitment to help bring violators to justice through the offering of this reward to crack down on abuse of these animals. Anyone with information on this cruel practice should call 855-NO-SORING or email equineprotection@humanesociety.org. The HSUS will protect the identity of all callers. The Walking Horse National Celebration is currently going on in Shelbyville, Tennessee. Please don't think that this is a single-breed issue or that it does not involve you or affect your work with horses. How the humane organizations, law enforcement and the government perceive and act on allegations of abuse are important to all of us. Your breed or discipline or livelihood could be affected somewhere down the line even if you have never seen a Walking horse and wouldn't dream of abusing any animal. Chances are, what happens in Shelbyville this week won't stay in Shelbyville. Click this link for full information on ordering Professor Denoix's Equine Distal Limb. A slide show of affected hooves from around the world; these hooves are all on Connemara ponies, although it is not known if this particular type of wall separation is limited to that breed. Few hoof problems have been as compelling as the relatively-recent one known around the hoof world as "Connemara hoof wall separation syndrome". Owners of the affected horses would prefer that it be called "hoof wall separation syndrome". Wall separations are commonly seen in the heel area of hooves, but this is different. At first, it was easy to dismiss the communications as white line disease or just poor hoof maintenance. But they kept coming back. Soon they had amassed evidence of Connemara ponies with this problem from places as far afield as New Zealand, Finland, and Canada. Robert Eustace of the Laminitis Clinic in England described the problems as "coconut matting hooves". I thought that was an apt description; in some cases, the inner, exposed hoof wall looked like steel wool fibers. Many cases of this type of dorsal hoof wall separation deteriorate to a diagnosis of laminitis. According to the owners' group, hoof samples of affected Connemara ponies referred to Eustace for treatment were analyzed by the University of Edinburgh, where they found a malfunction of lipid metabolism in the extracellular matrix of the hoof wall between the tubular structures of the hoof wall. In simple terms: there seems to be a lack of the 'waterproof glue' or 'cement' that holds the hoof wall tubules together, but the findings have not been documented. Nothing about the condition has been documented, other than by horse owners comparing notes. 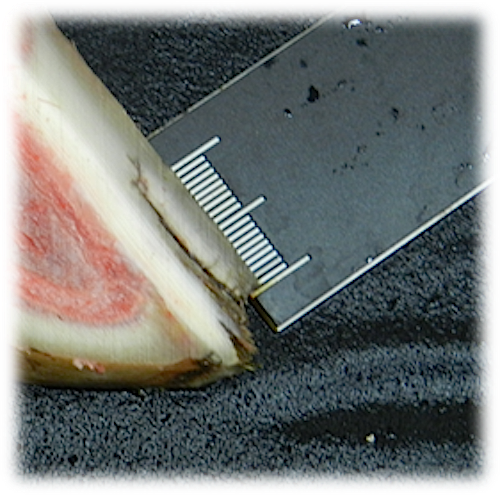 This image from UC Davis shows a ruler used to measure the extent of a separation lesion on a foot from a cadaver. Soon, the inevitable Facebook discussion group popped up. It became part of a web of information and communication that included a blog, press releases, and many promises that they would get to the root of the problem. They may not have reached the root but they are cracking the case. If you have a pet problem in the hoof world and you are sure that there has to be an answer, let this group of dedicated horse owners give you a model to follow. This hasn't been easy. On November 11, 2011, I interviewed a regional president and another officer of the American Connemara Pony Society who assured me that they had never heard of the problem and it was surely just a misunderstanding. A veterinarian concurred. In their defense, this problem is widespread geographically but still relatively uncommon. Since then, owners tell me, the Society has become aware of the problem. It is also possible that owners whose young stock exhibit this problem are not likely to bring them to shows or to comment much about the problem, in the interest of the value of their other horses. When a case cropped up near the university and they saw the problem firsthand, they were even more interested. Is this problem really limited to a single breed? I remember old farrier texts that complained about mice nibbling on the hooves of certain horses at night in the stable--that was a convenient explanation to owners for a problem that looked like the photos you see in the slide show. A confounding aspect of the problem is that it occurs in radically different environments, without respect to wet or dry, hot or cold, and appears early in the pony's life. One Connemara owner remarked, "I am seriously starting to think that this issue is probably quite widespread in the general horse population but appears so randomly that it is acknowledged just as 'bad feet with no known cause'. It is only when one has a small inbred population with the over use of certain bloodlines in an already contracted gene pool that the problem becomes more common and obvious. "Once there is a commercial gene test available, it will be interesting to see whether there is the same or similar problem in other breeds." Because the cases are farflung, documentation of treatment is sparse. In most cases, some combination or variation of supportive hoof orthotics, foot casts and glue-on shoes along the lines of laminitis treatment are used. Various topical treatments and nutritional supplements have been used. These efforts are under the heading of managing the condition; euthanasia is common. An example of the type of hoof wall undermining labeled "Hoof Wall Separation Syndrome" by the University of California at Davis, where research is continuing into this problem. Hoof Wall Separation Syndrome (HWSS) is an inherited condition seen in Connemara ponies and typified by the dorsal hoof wall splitting away from underlying structures. 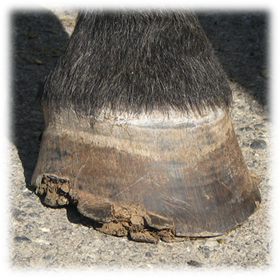 This hoof defect develops in young foals between one to six months of age. The condition results in afflicted ponies having to support weight on the sole of the hoof instead of the dorsal hoof wall. Affected animals can become severely painful despite careful management; their quality of life can diminish and euthanasia may be necessary. Even if the condition is initially controllable, ponies may still develop laminitis over time. HWSS is particularly troubling for the Connemara community because the parents of affected ponies are themselves completely unaffected. 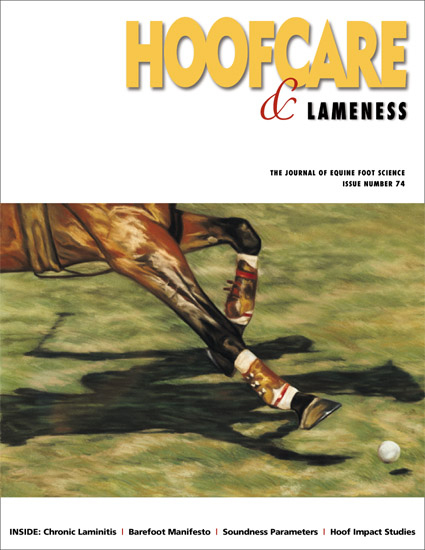 Although affected individuals do share common bloodlines, it is problematic to predict whether a particular breeding will produce a foal with unhealthy hooves. Investigation into the underlying genetic cause of HWSS has the potential to inform these breeding decisions, and could also provide insight into the disease pathophysiology. To investigate the underlying genetic cause of HWSS, a genome-wide association study was performed and a strong association between disease status and polymorphisms in a two-megabase (Mb) region of the genome was observed. Sequencing of candidate genes within this region is currently underway, and any functionally relevant genetic differences identified will be validated using a larger sample set. Consequently, we are still collecting DNA samples from both affected and unaffected Connemara ponies. If you are interested in submitting a sample, please contact Carly Stevens (cstevens@ucdavis.edu) or Kartika Jayashankar (kjayashankar@ucdavis.edu) for more information. Funding for this research has been provided by the Morris Animal Foundation, UC Davis Center for Equine Health, and Merial. Information for this research summary was provided by the Bannasch Laboratory at the University of California at Davis. Thanks to all the heartbroken Connemara pony owners who faithfully documented their horses' problems and to all the vets and farriers who have tried to help them, even if they couldn't explain the problem. Maybe someday they will. Click on the ad for more information about this anatomy chart that shows the zones and structures affected by HWSS. Click to download full details and ordering information. What's the most interesting equine research organization that's not on your radar (yet)? Meet the Saddle Research Trust. The Saddle Research Trust (SRT) was founded in 2009 to promote the welfare of the ridden horse and to raise awareness of the widely underestimated issues surrounding saddles, equine backs and performance. They've hosted conferences, supported research and initiated an innovative research-associate program. We all take saddles for granted but anyone who works professionally with horses also knows that saddles can be an "x" factor in a horse's performance--or a rider's, for that matter. It seems there is more we don't know, scientifically speaking, than we do know, when it comes to the interaction between a a horse's musculo-skeletal system, a saddle, and a rider. The Saddle Research Trust is a charitable organization aiming to provide support and advice, both to the horse-owning public and to industry professionals. Its board of trustees and advisory committee include leading veterinary professionals, physiotherapists, saddlers, riders and trainers. Trust Director Anne Bondi is currently undertaking a Doctoral Research Program at the University of Sunderland in Great Britain; she is studying the interaction of horses, saddles and riders. The SRT facilitates collaborations between its Research Associates and promotes objective scientific research in order to further its aims. What does the future hold for the Saddle Research Trust? 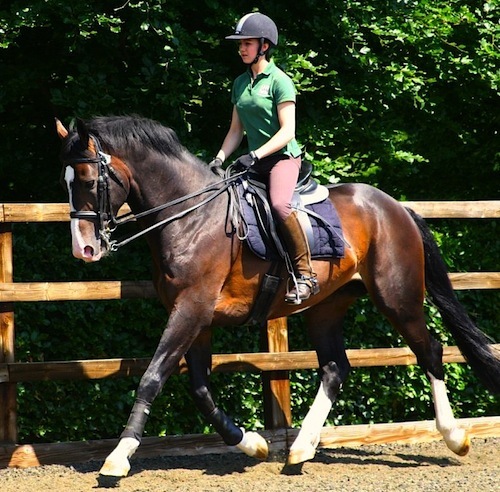 The Saddle Research Trust (SRT) is urgently seeking an honorary fundraiser to help progress some exciting new scientific research on the influence of the saddle on the welfare and performance of horses and riders. If you have a passion for horses and a good working knowledge of fundraising and wish to be involved with making a real and long-term difference to the welfare and performance of riding horses globally the SRT would be delighted to hear from you. The Equine Centre of the Animal Health Trust, a UK based charitable organisation, is dedicated to enhancing equine welfare through improved understanding and treatment of disease in horses, especially related to lameness and poor performance. 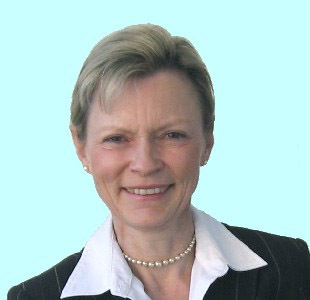 Led by Sue Dyson and Rachel Murray, its work is world renowned for advances in equine orthopaedic injury and diagnostic imaging. The Royal Veterinary College (RVC) is the UK's first and largest veterinary school and a constituent College of the University of London. It also provides support for veterinary and related professions through its three referral hospitals, diagnostic services and continuing professional development courses. The world's leading reference book documenting equine hoof anatomy and imaging can be yours. The podium was crowded at the King's Troop Royal Horse Artillery Barracks in Woolwich, London on the summer night of July 29th. The Olympics had begun a few days before. The world had arrived in London. At nearby Greenwich Park, the eventing was in full swing. A team medal ceremony was in order; even though they represented different nations' teams, they were all from the same tribe: Team Farrier, indeed, in more ways than one. Anyone who has ever said, "That farrier deserves a medal" had their wishes come true that night. The farriers standing together for the official photo represented countries from as far away as Australia. 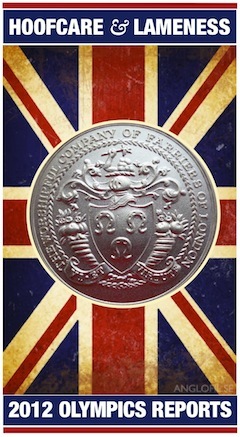 They were the guests of the famed Worshipful Company of Farriers. Each farrier was presented with a certificate and engraved silver medal by the Master of the Company, Mr Stephen Scott. "The Company decided to hold a reception to mark the contribution made by the team farriers, both from the UK and overseas, to the success of the London 2012 Olympics," Mrs Clifford told the Hoof Blog via email. "We were very fortunate to be able to hold it at Woolwich Barracks, thanks to the Commanding Officer and staff of the King's Troop Royal Horse Artillery, which made it easy to transport the farriers to and from Greenwich Park. 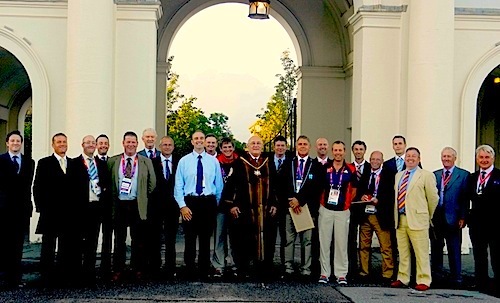 Farriers, dignitaries and hosts at medal ceremony: Captain Richard Todd, Troop Captain, King's Troop; Robert McIntosh (UK); Ben Benson (UK); Major Mark Edward, Commanding Officer, King's Troop; Lee Collins (UK); WCF Upper Warden, Major General Sir Evelyn Webb-Carter; Nicholas Deacon (UK); Marcus Thorne (UK); Sandy Parker (Australia); James Goddard (UK); WCF Master, Mr. Stephen Scott; Ian Hughes (UK); Paul Armstrong (UK); Jim Blurton (UK); Jay Tovey (UK); David Le Corre (France); Per Christofferson (Denmark); William Mulqueen (UK); Simon Persse (UK); WCF Middle Warden, Mr Simon Fleet; WCF Renter Warden, Mr Wayne Upton. (Farriers are listed by name only; dignitaries and hosts by name and title.) Photo provided by Gillian Harris, Forge Magazine. The evening began with a champagne reception, followed by a two-course buffet dinner. "Each farrier was presented with a certificate and engraved silver medal by the Master of the Company, Mr Stephen Scott; sadly and inevitably, not every eligible farrier was able to attend, as some had to be on duty that evening, but those who couldn't get there will receive their certificates and medals in due course." 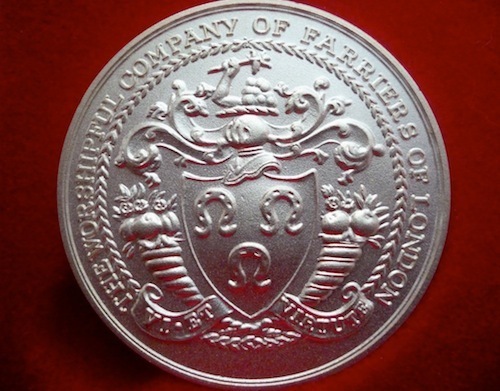 The silver farrier medal carries the Company's coat of arms. The reverse of each has the individual farrier's name engraved on it. The Company's motto, Vi et Virtute ('By strength and by virtue') is at the bottom. The Clerk said that those team farriers were either obliged to work at that time, or had not yet arrived. The group included a team of British farriers working under London Olympics Lead Farrier Jim Blurton; they provided services to countries that were not staffed with a team farrier. They were also stationed at each arena and warmup ring, as well as staffing the Olympic forge at Greenwich Park. They were highly visible on the telecast of the equestrian events, as one farrier was stationed at the out gate of the main arena, where one of the BBC/NBC cameras was pointed for each dressage rider and showjumper. Mrs. Clifford continued, "We have received very positive feedback from those who were there, and the event achieved its aim of recognizing the commitment made by the farriers to the well being of the horses involved and to the success of the Games overall." 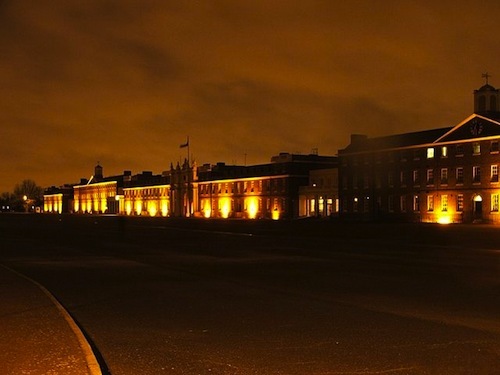 About the King's Troop: The Royal Artillery Barracks at Woolwich in the Royal Borough of Greenwich in London, was built in the late 1700s as the home of the Royal Artillery. The King's Troop, Royal Horse Artillery moved from the St John's Wood Barracks to their new quarters and stables on the Woolwich site in 2012, bringing with them a complement of 75 or thereabouts horses, historic gun carriages and artillery pieces used for their display. The Barracks are the site of shooting events at the 2012 Summer Olympics and Paralympics. About the Company: The records of the City of London Corporation show that on 27th March 1356, in the 30th year of the reign of Edward III, the Mayor, Henry Pykard, summoned before him all the farriers of the City to deal with the many offenses and damages which had been committed by "people not wise therein" who kept forges in the City and meddled with practices which they did not understand, to the greater detriment of the horse. The Mayor ordered the choosing of two Wardens who were given full power to oversee and govern the trade and to deal with any default. It may be 650 or so years later, but the Worshipful Company of Farriers is still overseeing the trade--in London and throughout the United Kingdom. 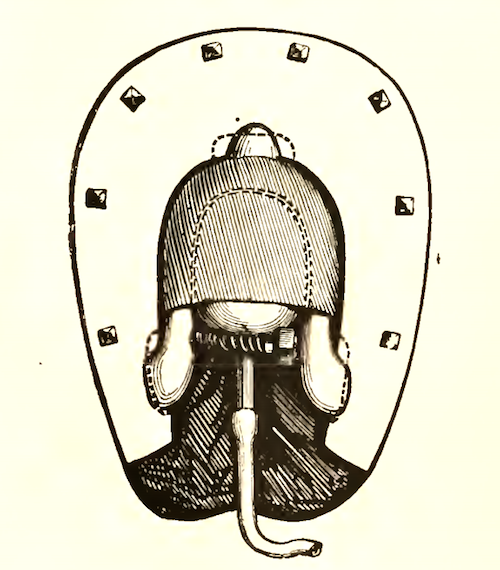 Farriery in Britain is regulated by an Act of Parliament which requires that only professional farriers in possession of the Company's Diploma can shoe horses. 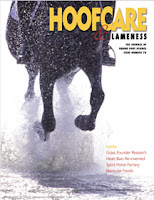 Hoofcare and Lameness thanks Mrs Charlotte Clifford, Clerk of the Company, and Gillian Harris of Forge Magazine for their kind assistance with this article. 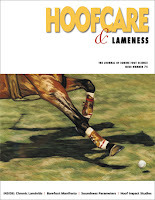 Click to read more about (and order) the #1 reference book for hoof anatomy in the world! The end of August has arrived and that means just one thing: it's time for the Tennessee Walking Horse National Celebration in Shelbyville, Tennessee. It's one of the largest and possibly most successful horse shows in the United States. As many as 170,000 people from 40 states have attended the 11-day show in recent years. As many as 2,660 horses may compete in the show's171 classes; more than $650,000 in prizes will be awarded. And if there is a "hot spot" in the horse world for the next two weeks, this show is it. The reason? In spite of more than 30 years on the books, a federal law designed to stamp out the cruel practice of "soring" Tennessee walking horses has failed. These videos from trainer Winky Groover are posted for educational purposes. Most people have never seen a Tennessee walking horse perform in the show ring, much less on the cross-ties being shod. But everyone does have an opinion. You should know the process of shoeing a Walking horse and what the different items used are called: packing materials, double-nail pad, hose clamp, chains, etc. The actual shoeing you see in the video below is not "soring", which would use chemical irritants, short-trimming, and/or sharp objects between the hoof dressing pad and sole of the foot to manipulate the horse's action. Everything you see here is completely "legal" and accepted practice. 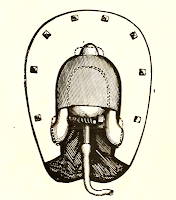 The shoeing video simply shows how a stack of pads is attached to the foot and how the foot is prepared for it. In the first video, Winky gives a very general description of the difference between a flat stack and a wedge stack and how trainers adjust or increase the weight and shape of the stack to manipulate lift or reach. Today we learned that the "DQP" (non-USDA) inspectors at the Celebration plan to swab all the horses' pasterns to detect chemicals. This the latest in a confusing series of events in the past few months, including a lawsuit against the USDA, a de-certification of the Celebration's inspection organization, and the impression that the elimination of soring could simply be postponed indefinitely while lawsuits and countersuits sort themselves out. But the show must go on, and the Celebration says it is going to swab pasterns and that this is a great move forward. When used at the 2011 Celebration, swabbing revealed that 50 of 52 samples were positive for foreign substances. Most positives were for numbing agents. According to a press release from the Celebration, swabbing results will be made public during the event for the first time. Violations will be punished severely, the Celebration says, by suspending trainers’ licenses, disqualifying horses, removing ribbons, trophies and prize money. Will there be more news from Shelbyville about Walking horses and soring between now and Labor Day? Probably. But at least by watching those two videos you'll know the basics of the horseshoeing part of the equation. The human and legal parts of the equation are much more complicated. Thanks to the Tennessean newspaper for making these videos available. Hoofcare Publishing and Fran Jurga do not endorse or recommend the practice of soring. Tennessee walking horses are wonderful animals and deserve the best possible care as well as a speedy solution to this controversy. Techniques shown in these videos are for increased understanding only and are not meant for instruction or to pass judgment. 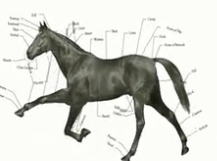 What if scientists took the same tools they use to analyze how horses walk, trot, canter and gallop and turned it to how they use their bodies? Forget the legs and hooves (or paws). Most mammals have a quantity of loose skin that they can move. That looseness gives the skin a locomotion all its own and now scientists are measuring it and trying to understand how and why animals are able to shake as much as 70 percent of liquid off their bodies. It's not a linear locomotion; it's a gyro, or rotational movement around the animal's axial skeleton. It's a good thing they can do it. If they couldn't, chances are the water would freeze, and they might get hypothermia, according to David Hu, PhD at Georgia Tech University. Or maybe the weight of the water would slow them down in their hunting--or fleeing from being hunted. It's a shame the study doesn't include an analysis of horses shaking. 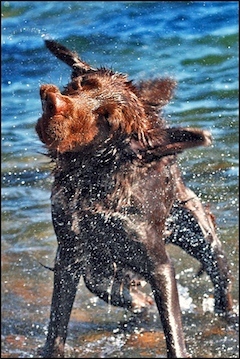 I think they do more of a whole-body shudder than a rotational loose-skin shake like a dog or other mammals. Maybe it has something to do with the way they can involuntarily twitch their skin to get rid of a fly. Their shake is powerful but unique, I think. And horses shake off dust as well as water. Shaking is all part of rolling. Read the abstract of Dr. Hu's paper. Visit the web site for Dr. Hu's lab at Georgia Tech. Before he became fascinated with shaking dogs, he researched how mosquitoes fly in the rain. Click to go to easy ordering page; this poster can soon be hanging on your wall! 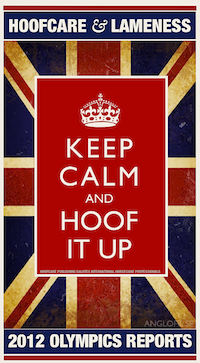 It's Sunday, so let's have some Hoof Blog fun. As you can imagine, the walls here at Hoofcare Publishing are plastered with new and old anatomy posters and gait diagrams. This one needs a stud girth and over-reach boots. 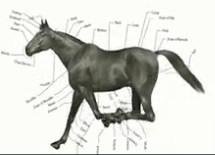 One day I started wondering about the horses who model for anatomy diagrams. Were they chosen for their ideal conformation--or did they even exist at all? Are there such ideal horses out there? I like to think that when I turn out the lights in the office at night, the fun begins. Books open and close on their own. Trophy hammers hit on trophy shoes (but never leave a mark). Rasps rise up and sing a duet. But until I saw this video, I hadn't considered what might happen with the anatomy posters and the gait charts. Maybe they have fun too and those horses that stand still so perfectly all day on the wall suddenly rear up and take off. Michael Mansfield, who animated the anatomy models in this video, obviously has a great sense of humor, as well as a lot of patience to have animated all these still images. Obvious too is that Mike Mansfield's anatomy model horses never attended a Hilary Clayton lecture on equine locomotion. I like to think that when I turn out the lights tonight, all those perfect standing models will give the gallop a try. Thanks to Mike Mansfield, for inspiring me to think that anatomy diagrams might have a secret life!